What conditions does SODIUM SULFACETAMIDE-SULFUR Lotion Topical Sulfonamide Antimicrobials treat? 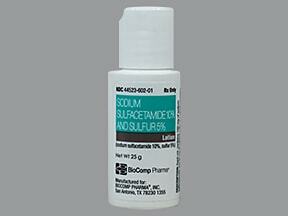 Rarely, sodium sulfacetamide products applied to the skin may be absorbed and may cause serious side effects. Stop using this product and tell your doctor right away if any of these rare but serious side effects occur: aching/swollen joints, rash on nose and cheeks, signs of infection (such as fever, persistent sore throat), signs of anemia (such as unusual tiredness/weakness, rapid breathing, fast heartbeat), unusual bleeding/bruising, signs of liver problems (such as dark urine, yellowing eyes/skin, stomach/abdominal pain, persistent nausea, vomiting), mouth sores. 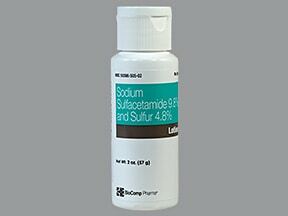 List SODIUM SULFACETAMIDE-SULFUR Lotion Topical Sulfonamide Antimicrobials side effects by likelihood and severity. What should I know regarding pregnancy, nursing and administering SODIUM SULFACETAMIDE-SULFUR Lotion Topical Sulfonamide Antimicrobials to children or the elderly? Some products that may interact with this drug include: skin products containing silver (such as silver sulfadiazine). Does SODIUM SULFACETAMIDE-SULFUR Lotion Topical Sulfonamide Antimicrobials interact with other medications? Are you taking SODIUM SULFACETAMIDE-SULFUR Lotion Topical Sulfonamide Antimicrobials? Are you considering switching to SODIUM SULFACETAMIDE-SULFUR Lotion Topical Sulfonamide Antimicrobials? 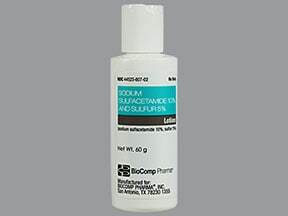 How long have you been taking SODIUM SULFACETAMIDE-SULFUR Lotion Topical Sulfonamide Antimicrobials?